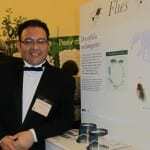 a guest blog by Jorge I. Castillo-Quan, written for the 2015 Write About Research Competition. If you had not heard of the term anti-ageing you have not noticed spam emails, television advertising, and articles in magazines. The term anti-ageing has definitely permeated our society. Most scientists struggle to explain to their non-scientist friends what their research is about. When I tell my friends I study ageing and anti-ageing interventions, almost everyone has an idea of what that means. Or at least they think they do. Some people think I am developing the latest generation of creams that will make wrinkles disappear, or that I am finding remedies to prevent greying hair, or the solution that will avoid balding, or even make stretch marks go away. Those with more imagination, think I am trying to defeat death and make people immortal. However, none of these ideas are in any way close to what I do. I explain to them that I do my research on ageing using the fruit fly Drosophila melanogaster. Yes, I work with those little flies that lurk around your kitchen. If you are now thinking why on Earth are you studying fly ageing, I do not blame you. I thought this once too. The first thing you should know is that I am not interested in making immortal flies (though that could be cool! ), nor is my aim to understand how flies age per se. The simplest explanation is that studying ageing in an organism that is less complex than humans is more convenient and faster. After all we share 60% of our DNA with the fly. Although we look very different more than half of our genes have a counterpart in the fly. Similar things can be said about the roundworm Caenorhabditis elegans which shares 40% of our DNA. But why use these organisms that seem so unrelated to us? They have shorter lifespans and show traits of ageing. For example, as worms and flies age, they lose their ability to move properly. Is true that we do not wiggle around like worms, or fly and climb as much as flies do, but these rather specific behaviours are controlled in similar ways by locomotor programmes, some of which are similar between species. Hence, we can use these as readouts of how quickly a worm or fly is ageing. Furthermore, worms in laboratories only live about 2-3 weeks, while flies about 3 months. If you were to compare these lifespans with that of the more traditional laboratory organism, the mouse, you will find that you would be able to complete over 10 survival experiments in flies while only completing one survival experiment using mice, that live around 3 years. Each organism has its advantages. Worms are transparent so you can look and examine how every organ is changing over time. But while they do have a semi-organised neuronal system, they do not have a proper brain. Flies do, and research studying the development and organisation of the fly brain has advanced our understanding of the human brain so much so that it has been awarded several Nobel prizes in Physiology or Medicine. Having established that flies are simpler than mammals like us and mice, and that they are relatively short-lived, the question remains, how am I developing the latest generation of anti-ageing creams using Drosophila? I have to be honest here and say that I am not working on this. Although the term anti-ageing is more commonly associated with these kind of interventions this is not the aim of my research. I study ageing to try to understand its biological principles and what drives it. I am sure that you thought that this is exactly what the multi-million anti-ageing industry is doing, but no. Although some (very little) of what is going on in the big wide world is labelled as scientifically proven, it is not. Or not at the standard that is required for prescription pills and creams you get from your GP or other health professionals. The anti-ageing industry as we know it is not regulated and is merely cosmetic. When biogerontologists (biologist studying ageing) talk about anti-ageing, we talk about physiology (function), health and disease. I try to study ageing to improve health during old age. Ageing is the major risk factor for many of the killer diseases of our time, like diabetes, cardiovascular disease and cancer. Understanding what makes aged bodies vulnerable to threat of these diseases should be a major concern of our generation. As our societies are growing older it is expected that our health systems will be overwhelmed with treatments for patients suffering from these chronic conditions. No hospital running on public funds will see you for wrinkles or stretch marks when you are 65, but they certainly have to see you for a growing lump, forgetfulness, urinary problems and other serious health issues. For far too long we have considered growing older as two extremes, either as a burden to society, or as the great achievement of our generation. After all living to a 100 was quite rare 100 years ago. We should celebrate our older population and the best way is by enhancing their health and allowing them to live a fulfilling life, not one of deterioration and despair. Next time you see an anti-ageing cream, think about this: would I rather have beauty or health? If the latter is your choice, just wait a little bit longer, we are working on it. Jorge graduated with a Medical degree from the Autonomous University of Yucatan, Mexico. After this he completed an MSc in Clinical Neuroscience at the UCL Institute of Neurology, and a PhD in Genetics, Neuroscience and Biogerontology from the UCL Institute of Healthy Ageing (IHA). Currently he works as a Research Associate at the UCL IHA and Research Department of Genetics, Evolution and Environment.